PyCon, or Python Conference is an annual conference to both discuss and promote the use of the Python programming language. It is held in many regions and countries, including Malaysia. PyCon MY is a subset of the International PyCon community organised by Malaysia, which debuted with a mini PyCon MY in 2014. Since then, the local community has grown significantly to enable Malaysia to host PyCon APAC 2017. PyCon APAC 2017 represents the Asia Pacific region of the scene. This opens up opportunities for the regional Python users and developers to collaborate and learn from one another. 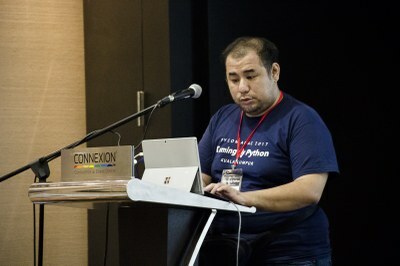 Most of the presentations for this year’s PyCon APAC conference involves educating and integrating the topics of Machine Learning and Data Science into Python, listed below are the highlights of the conference (As per the author). Luis is the Founder, Senior Data Strategist and Data Scientist of SGX Analytics, an NYC based Data Science/Data Strategy advisory firm. He is also featured in the Data Science Handbook as one of the top 25 Data Scientists in the US. For his presentation, he approached Machine Learning, however, with a twist. Luis tackles the concept of Creative Intelligence with Machine Learning, viz, teaching a machine to create music - something thought to be only possible with human creativity. With Python, he programmed an AI capable of visualising the musical data into sound, or as Luis refers it, Sonification. This presentation unlike no other, really showcases the power of Machine Learning and Artificial Intelligence. Above all, it displayed that the growth of technology has no limit, even reaching the territory of Creative Intelligence which was only assumed to be a Human-centric field. Jessica McKellar is an entrepreneur, software engineer, and open source developer from San Francisco. She is a former Director for the Python Software Foundation, PyCon North America’s Diversity Outreach Chair, and a maintainer for several open source projects, including OpenHatch and the Twisted event-driven networking engine. For her outreach efforts in the Python community, she was awarded the O’Reilly Open Source Award in 2013. Jessica shared her experience with a non-profit programme called, The Last Mile. This programme takes place in the San Quentin State Prison, the largest prison in the United States. It aims to teach inmates programming in order to ensure they have an opportunity to return to normal society upon release. Jessica explained about the difficulties of the programme, having no internet for the inmates, they have to learn to code based on provided PDF’s. However, despite the circumstance, most of the prisoners are enthusiastic about this opportunity and made full use of the program. Representation, aiming to properly represent people in a system. Swee Meng brought up the issue regarding the lack of Civic Technology in Malaysia. Despite the Parliamentary Documents being available for all, access to it is hard as there is little to no platform to distribute it. Besides sharing the methods to obtain the documents, Swee Meng also described the state of parliamentary documents in which it is filled with redundant data, thus inspring his goals to systematically extract the important information from these public documents for wider accessibility and sharing, to encourage greater citizen involvement. Sinar Project and Swee Meng aims to make the Malaysian Government an Open Government, they plan to provide reproducible Data Access and Transparency to Government information and as well utilise it for the public good. Rizky Ariestiyansyah is a Chief Technology Officer at IndonesiaX and he advocates EdTech and Blended Learning. Rizky presented on blended learning, educational technology, and his attempts at implementing it in Indonesia. Blended learning incorporates learning and education with online digital media instead of a traditional classroom. Although, in some variations of blended learning, classrooms are used as well. Rizky also detailed many of the advantages and disadvantages of blended learning, with some of the advantages such as an increase in student interaction, borderless teaching, allowing students from many regions to collaborate and much more. However, the main disadvantage of this program is that there is a necessity for the hardware and internet connection, many of which is not prevalent in Indonesia. Blended learning is a civic technology that has the potential to provide good education and quality trans-borders, What Rizky is doing is allowing the access of information via Peer to peer sharing, Community Organising and Community Forums. Mark Hollow was not a programmer at the start, having graduated in classical music. He later got into Python which brought him here today, transcribing and digitising historical documents. Mark presented about his attempts to transcribe Bangkok’s old and historical documents from the 1800s. He compiled his experiences and is ready to share it with the conference. His talk is mainly about the tools he used to analyse the document via a page-on-page basis and the difficulties he faced transcribing the dilapidated text. PyCon is an event where people gather as a community and is organised by the community to provide a platform to eagerly share and learn from one another. There are many attendees, all of them with varying experiences and expertise, but what brings them together is their love and support for Python. The environment of this community really impacted me, and serves as a good encouragement to participate in more events, particularly hackathons to further assimilate into the community while developing programs and civic tech for Malaysia. This experience was very valuable for a youth like me, PyCon has given me the opportunity to engage and listen to high-level conversations and information normally not available for the average youth. I thank Sinar Project for giving me this opportunity and I look forward to having more opportunities to engage and contribute in other communities as well in the future. Ka Shing is currently full-time Computer Science student at Monash University Malaysia.